Didyma – Apollo TempleA sacred temple, the Didymaion, or Temple of Apollo, sits in ruins, not created by time, but by an earthquake in the late 15th century, leaving behind an outstanding archeological site, which is very easy to visit while on a crewed yacht charter along the western coast of Turkey. Tucked into a bay, Didyma, now known as Didim, fits right into a yacht charter itinerary while cruising along the western coast of Turkey and the Greek Dodecanese Islands. Start your crewed yacht charter in Kusadasi after visiting Ephesus, visit the Greek Islands of Samos and Patmos and then cruise to Didim to visit the ruins of the ancient Temple of Apollo when on a crewed yacht charter through the Aegean Sea along the western coast of Turkey. Home of the second most important Oracle in ancient times after the Oracle of Delphi, there is evidence that a sacred temple was located on this site, next to a sacred stream, from as early as the 8th century BC. It was not until around 300 BC however that the present Temple of Apollo, of which the ruins remain today, was begun to be constructed. An immense project, intended to be the fourth largest temple in the Ancient World, the Temple of Apollo was begun, but never finished. 120 columns were originally planned for the Temple, each over 64 feet high; the tallest columns of any structure to have been built at that time. 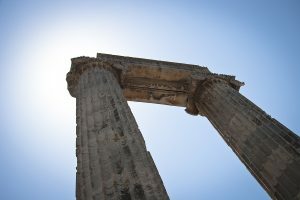 History reports that Caligula intended to complete the Temple, however; 5 centuries later, the Temple of Apollo was still not completed, and the Oracle was silenced forever by the edit of Theodosius to Cynegius in 385 AD. As Christianity grew, the sanctuary inside the Temple was eventually replaced by a church. The Temple of Apollo was an unusual construction, as the Temple was built without a roof, with the many tall columns reaching for the sky around an open inner courtyard. 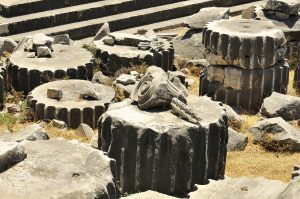 In 1976, German Archeologists uncovered, scratched into an unfinished area of the Temple, plans or “blueprints” for the building of the Temple, including costs for carving the stone columns, and evidence of the geometry used to create the slight bulge or “entasis” which would trick the eye into seeing the column as straight throughout the height instead of tapered. Finding these plans scratched into the stone surfaces provided an extraordinary glimpse into what was the everyday life of building an extraordinary Temple in the Ancient World. 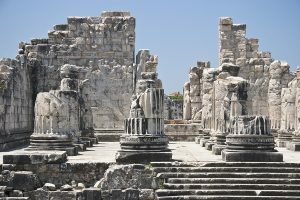 Connected to the ancient city of Miletus by a 12 mile “Sacred Way”, pilgrims visiting the Oracle made their way past many statues along the Sacred Way to the Temple of Apollo. The Oracle only spoke after 3 days of fasting, and then only when in bodily contact with the sacred waters from the spring. Predictions were probably given in prose translated by priests into verse, and unfortunately for the many seeking an eye into the future, the Oracle did not speak on a regular basis. Sometimes weeks would pass before the Oracle provided the much sought after predictions. 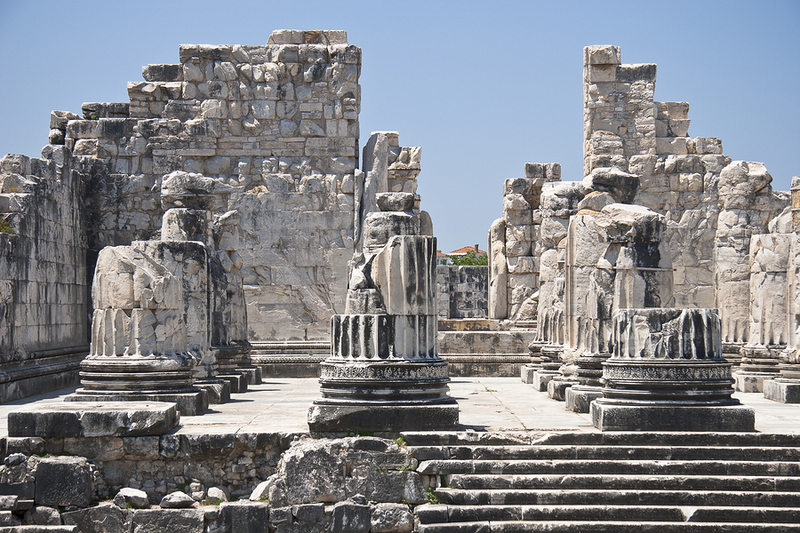 Today, on a crewed yacht charter, anchor in the small seaside town of Didim, and combine a visit to the Temple of Apollo with the nearby ruins of Priene and Miletus. Off the beaten track, you can truly see these “ruins in the wild” and wander through the sites to your heart’s content with no restraining fences or walls when on a crewed yacht charter stop in Didim along the western coast of Turkey.